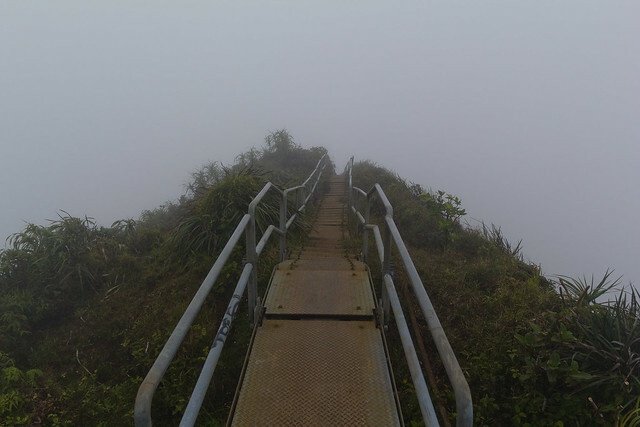 UPDATE: Haiku Stairs is closed. 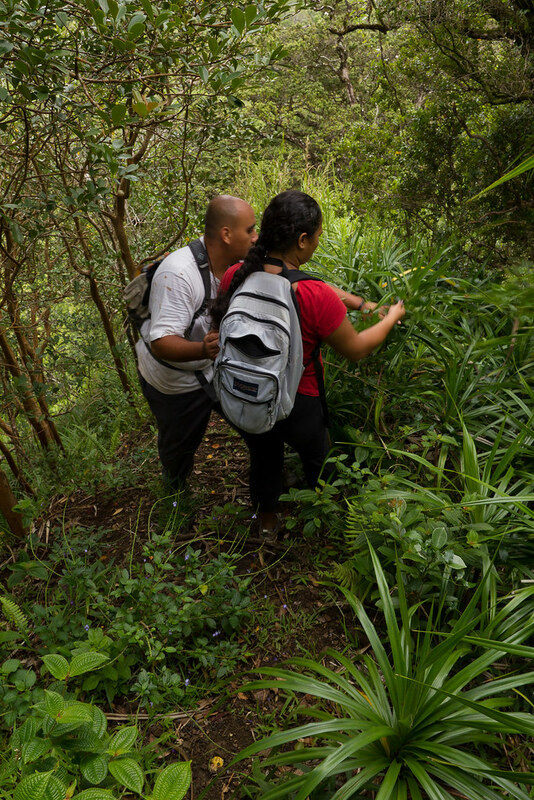 Access to the Stairs requires permission from numerous public and/or private entities that currently do not offer access, including the Board of Water Supply, City and County of Honolulu, and the State of Hawai`i. 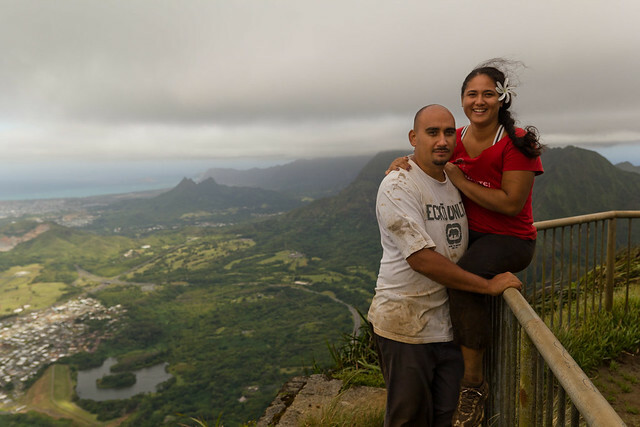 Please support the efforts of groups like the Friends of Haiku Stairs to educate and pressure the State and City & County to reopen this historic and breathtaking treasure of Hawai`i. 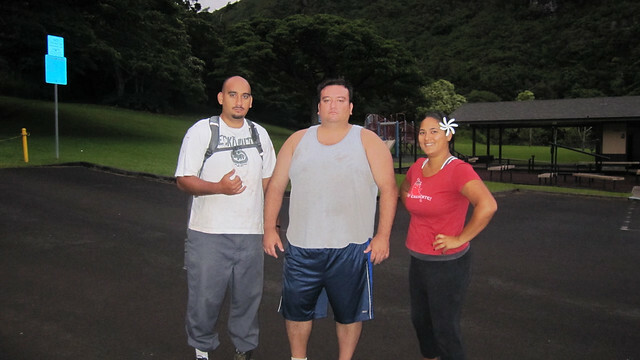 Kai, Chas, and I headed up Moanalua Valley Saturday (August 20, 2011), hiked to Pu`u Keahi A Kahoe and the Haiku Stairs. 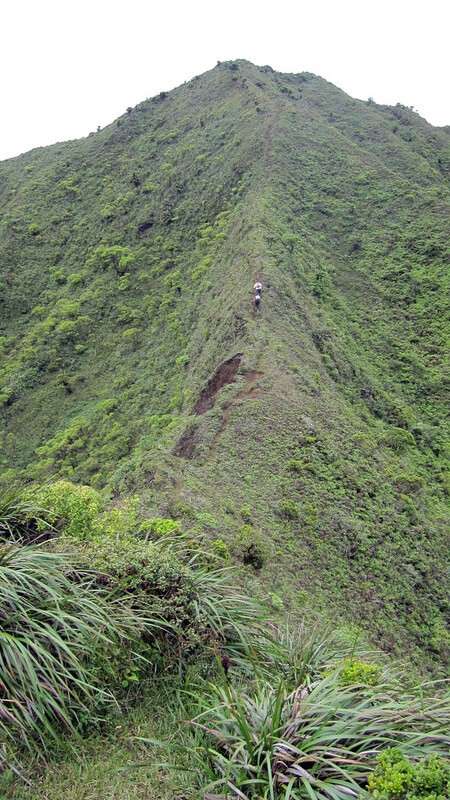 Keahi A Kahoe is a massive 2820 foot peak forming the southern border of Haiku Valley. 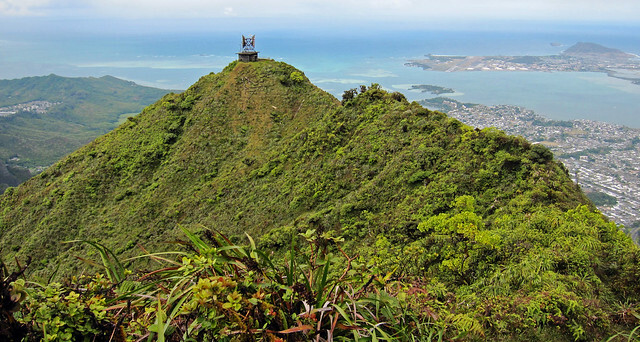 We planned on going up Moanalua Middle Ridge at the back of Moanalua valley then coming down Haiku Stairs. Sommer and I met Kai and Chas in Haiku where they staged their car. 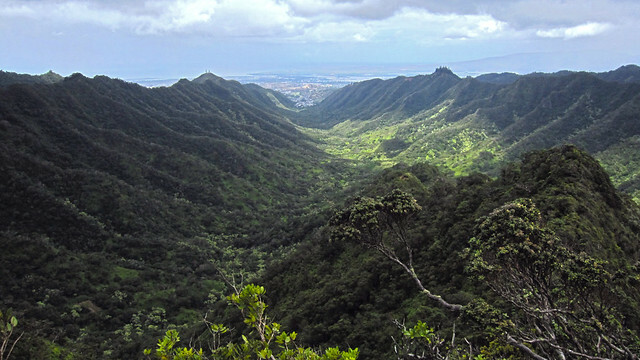 I loaded my post hiking clothes into Kai's car and we all headed in our car to Moanalua valley. 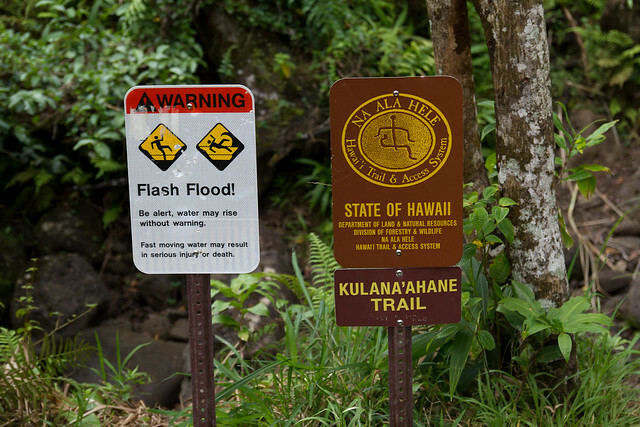 Unfortunately it wasn't til we got to Moanalua Valley that I realized I had put my hiking boots in Kai's SUV back at Haiku! So...we got back into the car and headed back to Haiku to get my boots. That dumb mistake cost us an hour. We didn't push off until 7 am -- still early -- but not as early as I would have liked. The hour delay would cost us later in the hike. 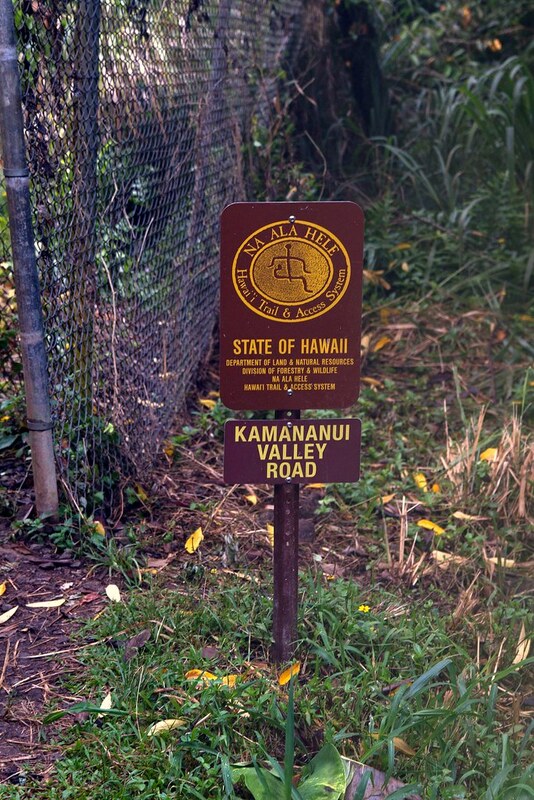 The beginning of the trail follows the Kamananui Valley Road up Moanalua Valley. 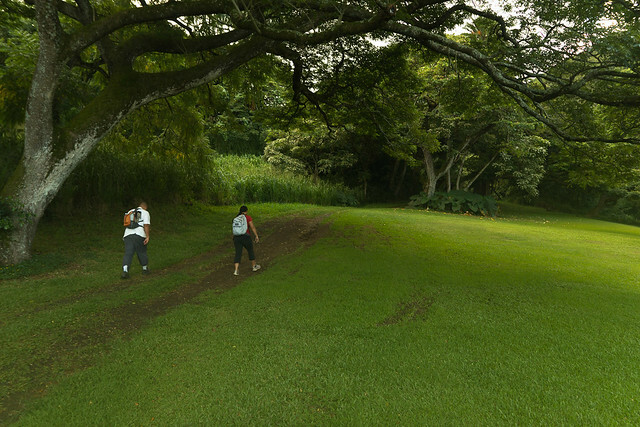 The road winds it way up Moanalua Valley, roughly following the Moanalua stream. 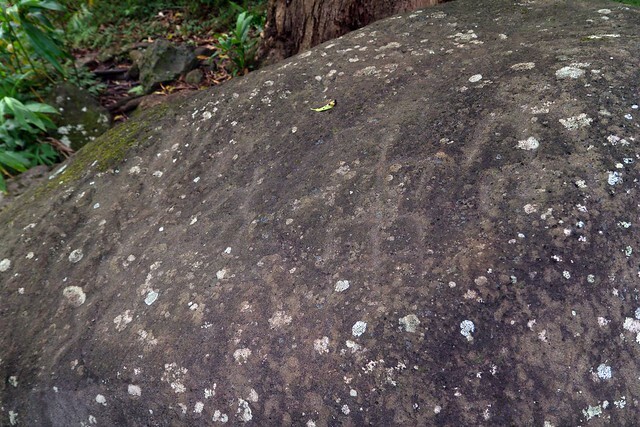 We stopped and took a look at the petroglyph rock along the stream. 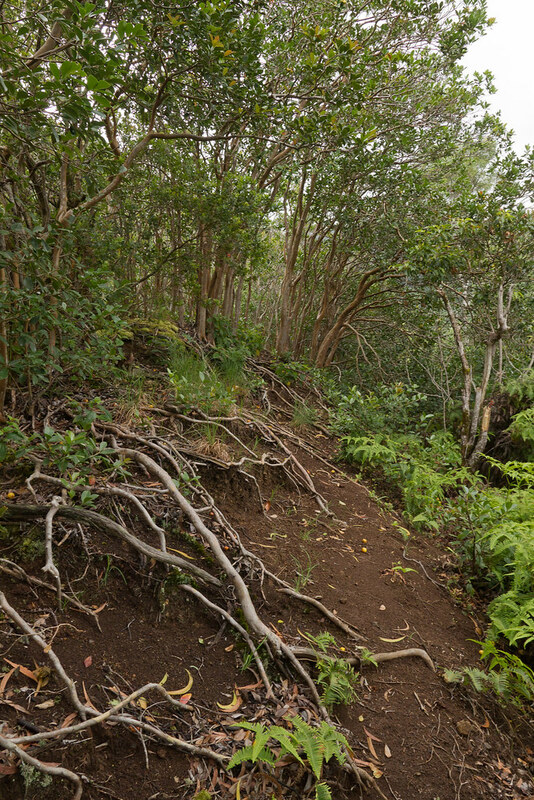 About 20 feet past the Kulana`ahane trail head is the start of the Moanalua Middle Ridge trail. 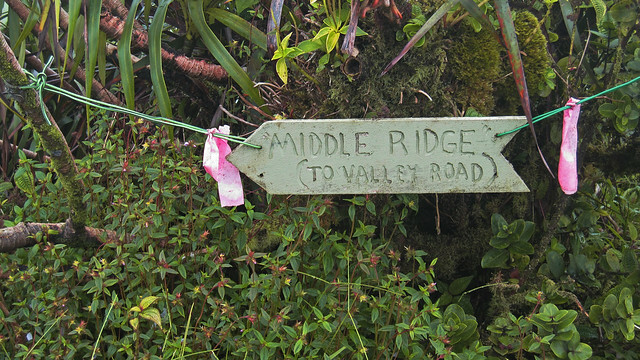 The Middle ridge is straight-forward ridge hike. 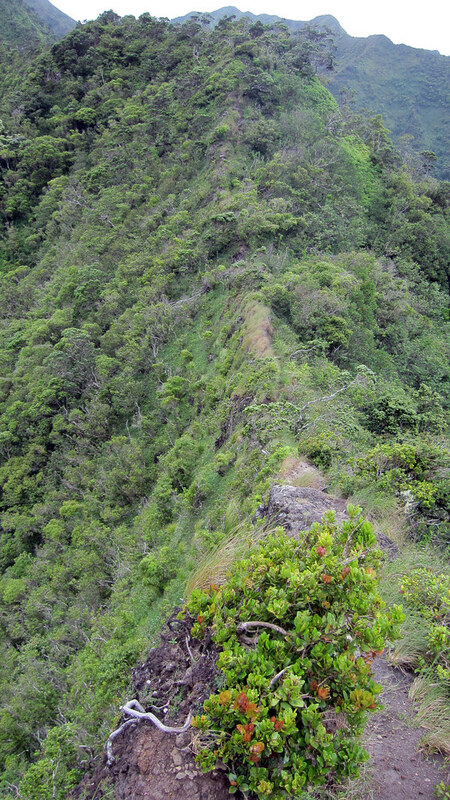 Unlike most of the Ko`olau, this ridge is no roller coaster. 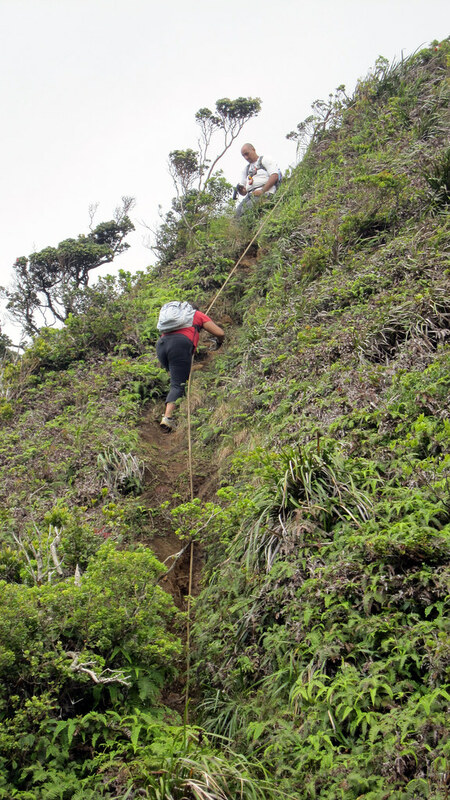 The Moanalua Middle Ridge is all uphill all the way. 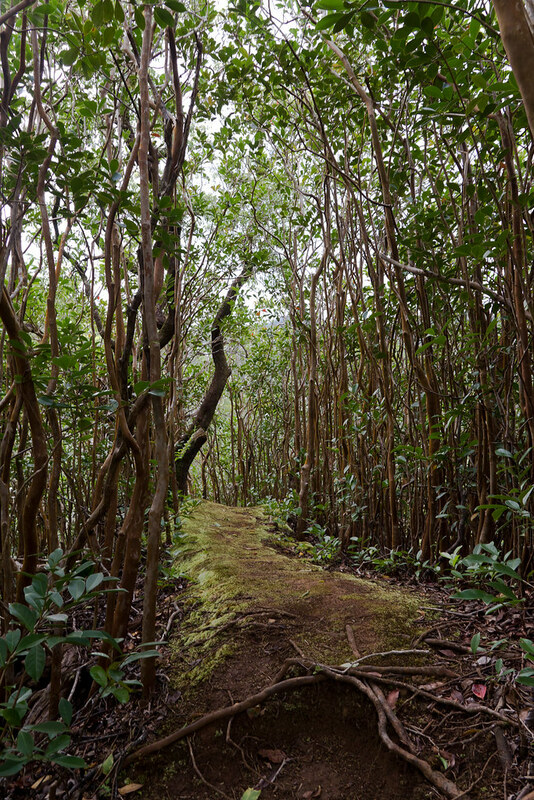 The Middle Ridge starts off under the canopy of the ohia, koa and guava. Soon the ridge becomes wind swept and exposed. 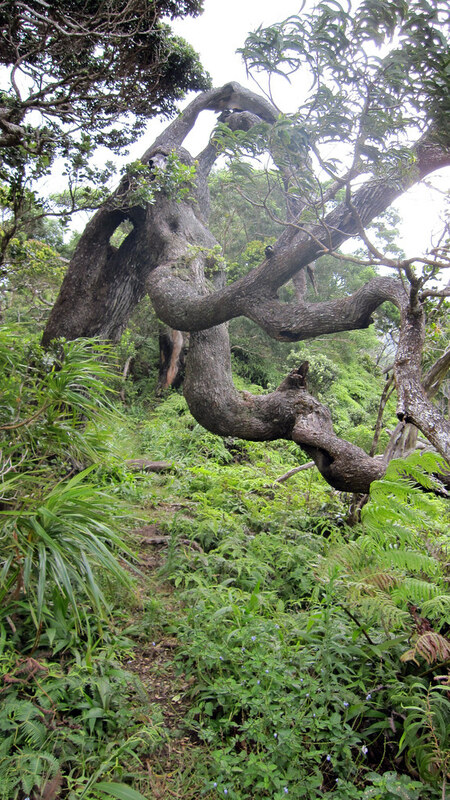 Some parts very narrow with little or no foliage to offer any sense of security or grip. 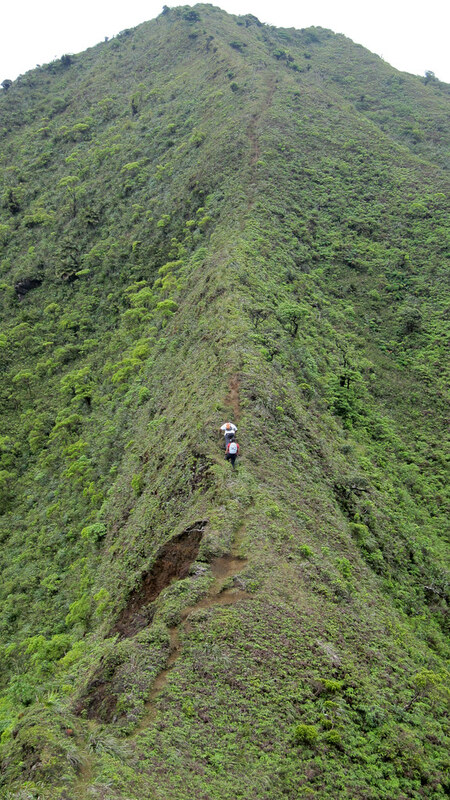 The trail also becomes really steep. 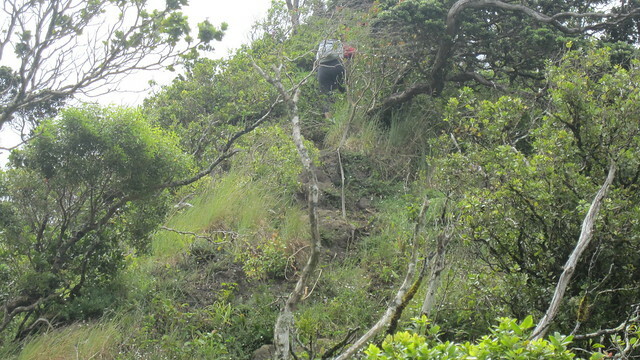 For most of the steepest sections ropes are installed that make climbing the ridge much more managable. 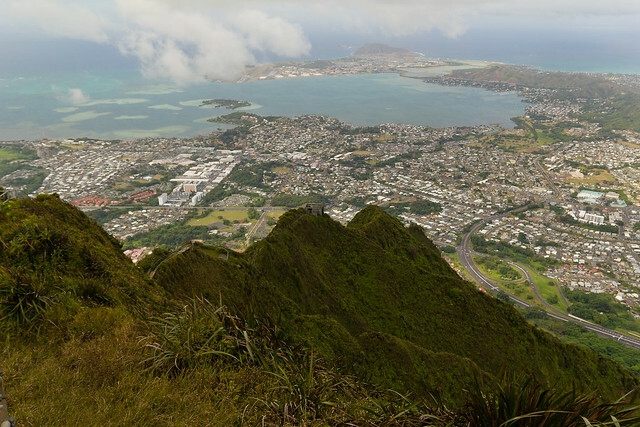 The quick gain in elevation makes for some impressive views of Moanalua valley. 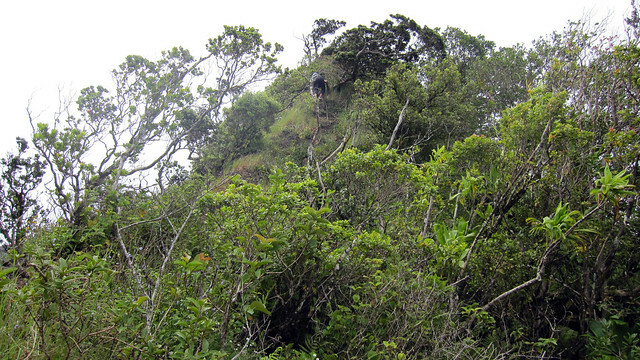 From the ridge you get a clear view of the climb to the summit of the Kalawahine trail on the Moanalua saddle. 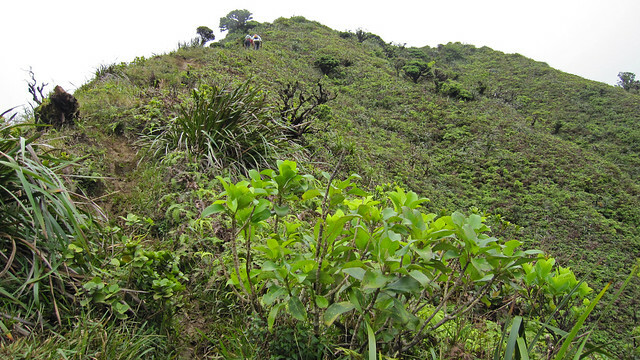 The climb up the ridge is dominated by a large and imposing peak seemingly at the top of the ridge. 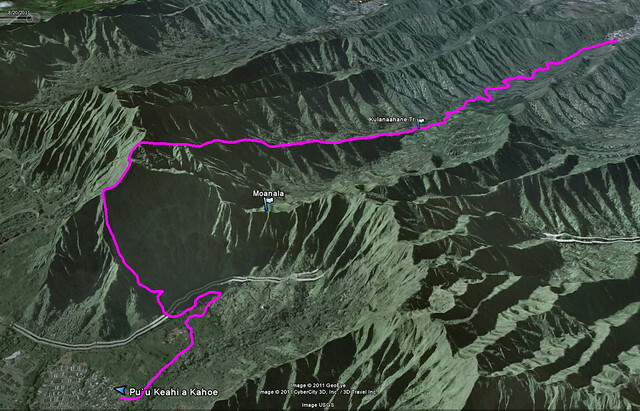 Unfortunately, it's a false peak, and the summit of Keahi a Kahoe is still another quarter mile further. As soon as we had climbed up the false peak, the clouds rolled in and the wind picked up. 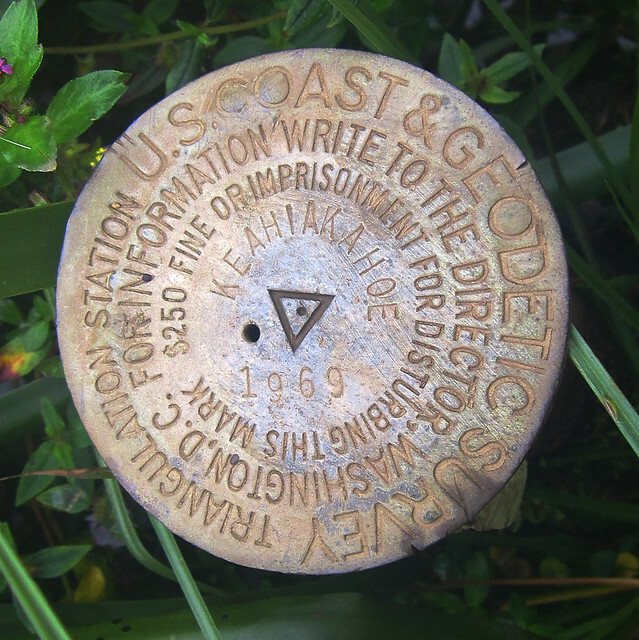 Visibility dropped to 20 feet. The winds started whipping up to 50 mph. 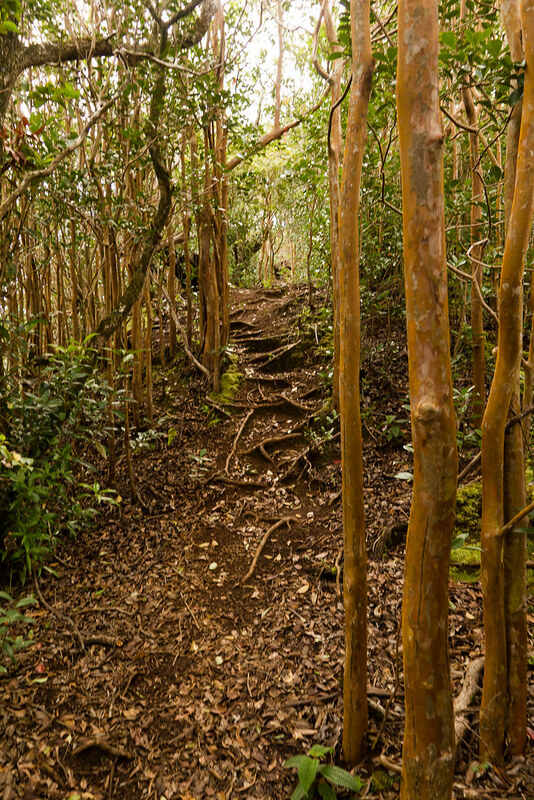 What was a difficult and narrow trail became nearly impassible. I had to put the camera away and stopped taking pictures. Remember how I left my shoes in Kai's car and it delayed us an hour. Now that was coming back to bite me in the okole. 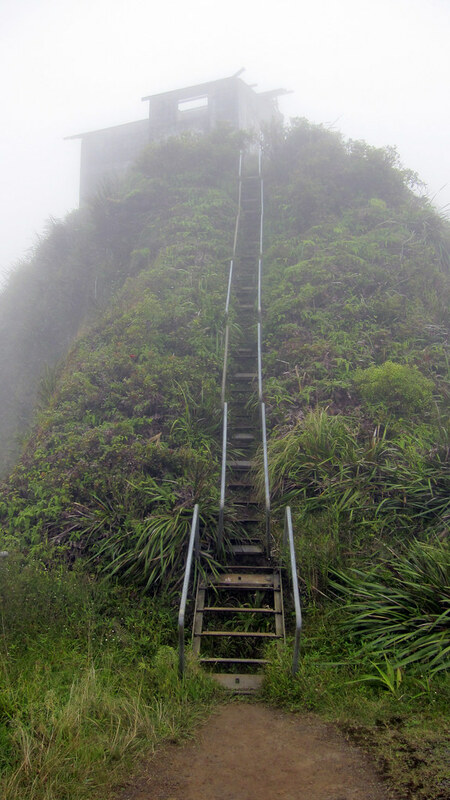 If we had started an hour earlier, we would have likely made it to the top of Haiku Stairs before this onslaught of rain began! For sections of the ridge we had to crawl on our hands and knees, slopping through rivers of mud on a trail sometimes just a foot or two wide! 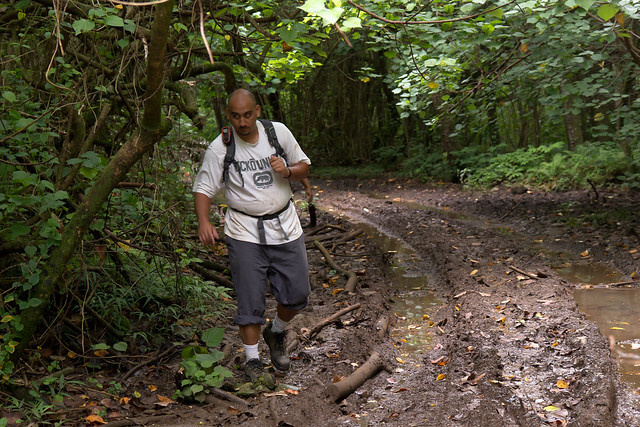 I swear I was wider than parts of the trail we crossed! 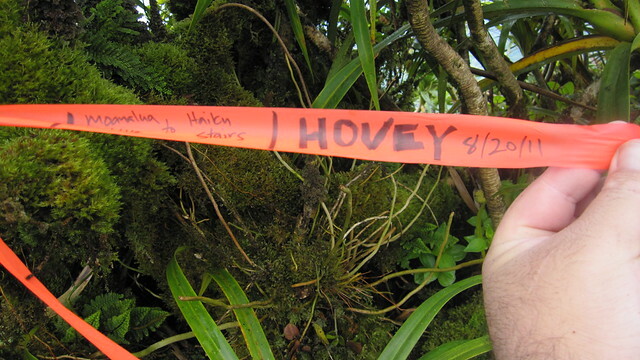 The three of us huddled under an ohia shrub for over half an hour in an attempt to wait out the rain. Soaked from head to toe we tried not to freeze, huddling in a little pocket free from the whipping wind. 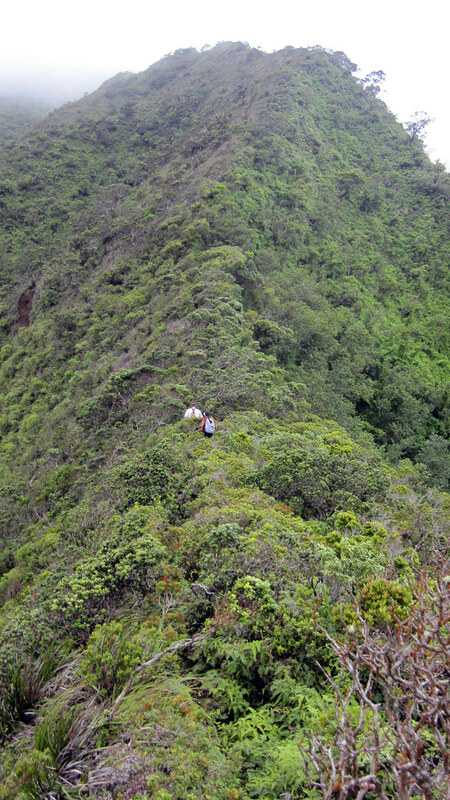 Deciding we could wait no longer we pushed on, crawling up the ridge in the wind and rain . 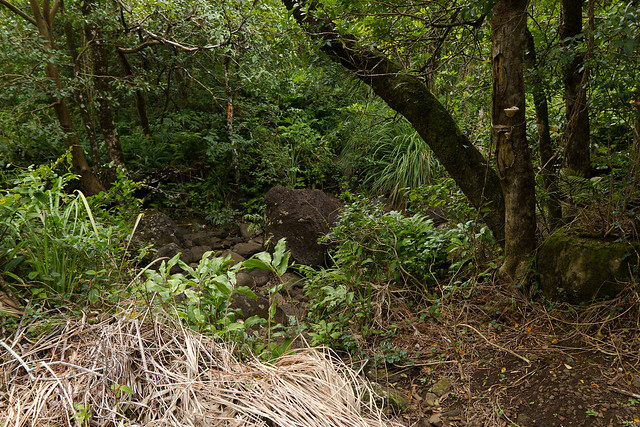 After what seemed an eternity crawling and struggling in the mud the rain started to let up. 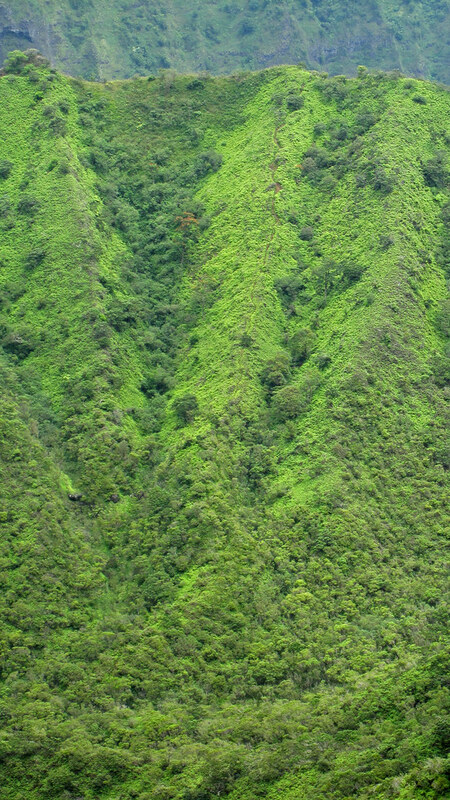 A few moments later the clouds lifted and we could see the Ko`olau ridge just a off to our right. 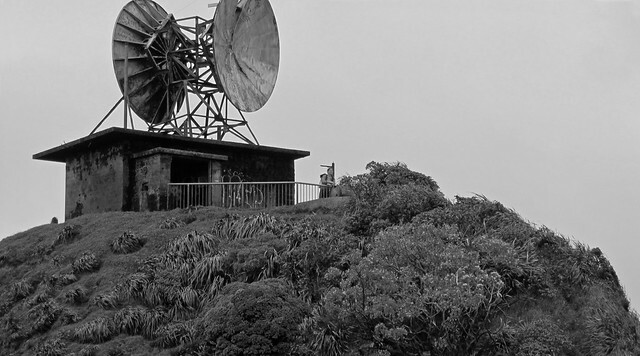 As the clouds lifted the radar relay station off to the right came into view. 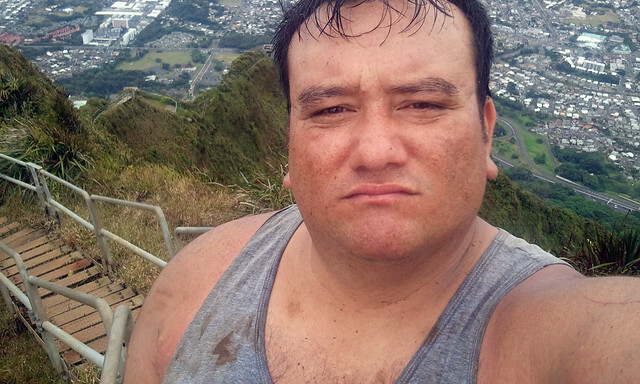 Within minutes were were at the top of Pu`u Keahi a Kahoe. Success! Thankfully, the clouds lifted and the sun came out. The view from the summit was beautiful! 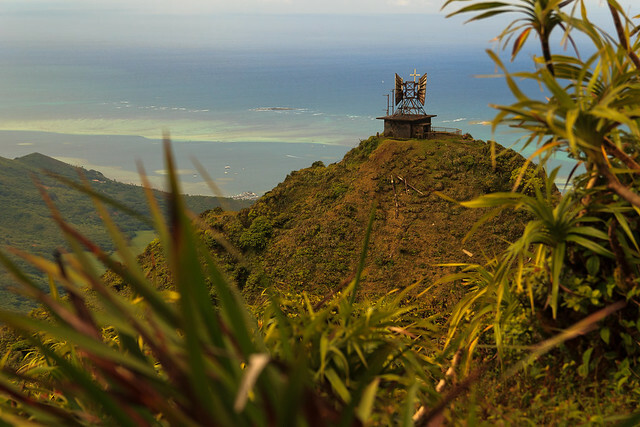 From the summit there was a perfect view of the CCL house at the top of Haiku Stairs. I have been wanting to get this shot for a very long time. 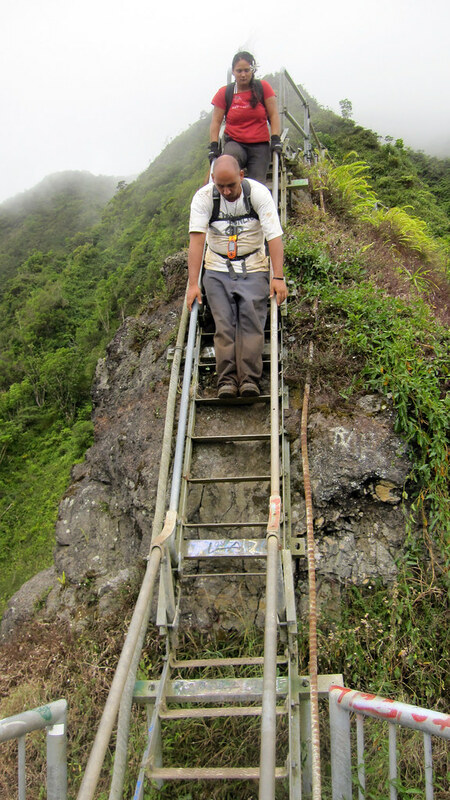 After coming up the steep and exposed Moanalua Middle Ridge, Haiku Stairs was a very welcome and sturdy sight! I've never been to the CCL house (or on the stairs) so late in the day. Usually I'm on the stairs very early in the morning. 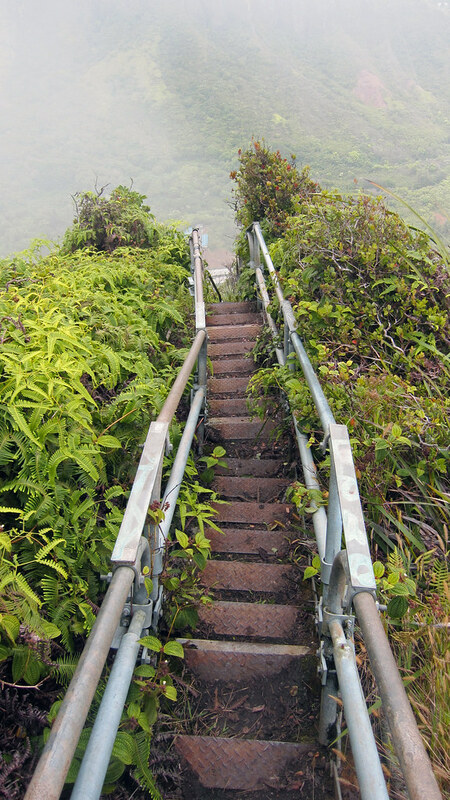 Today we didn't get to the stairs until 4 pm, nine hours after pushing off from Moanalua valley park. After taking some pictures at the top we made our way down the stairs. 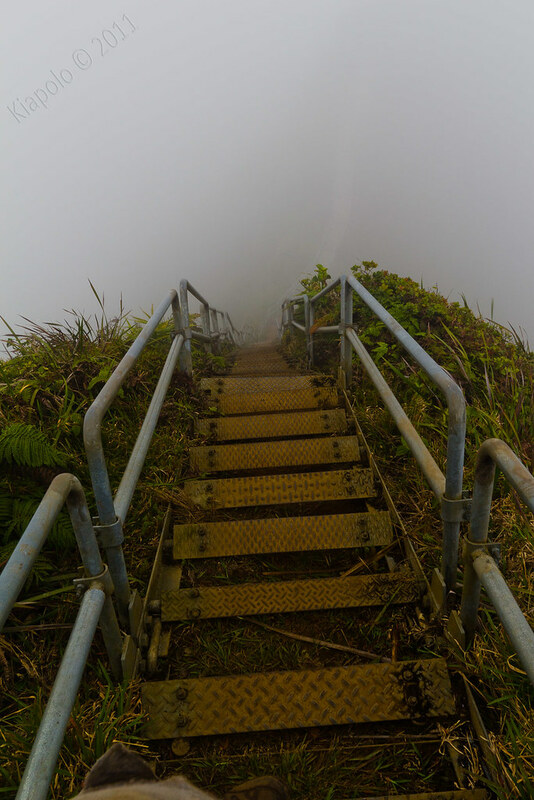 As soon as we started down the stairs the clouds rolled in and it started to rain. 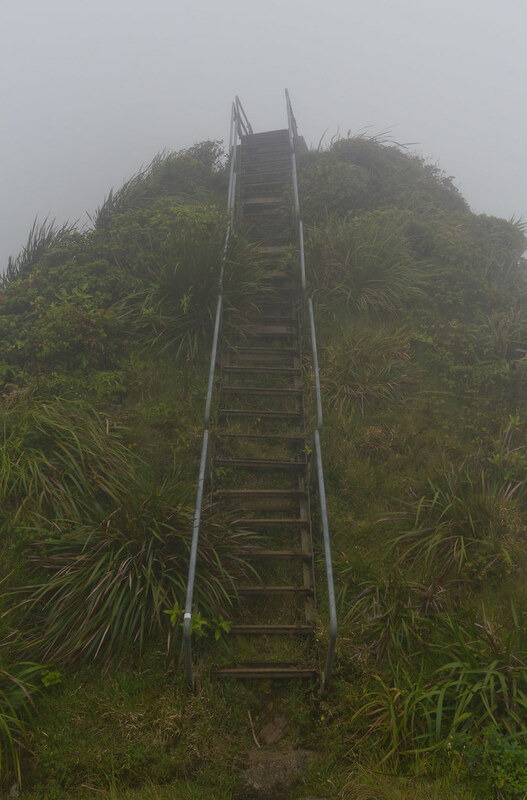 Thankfully the rain didn't stick around, but unfortunately the stairs were soaking wet and very slippery. 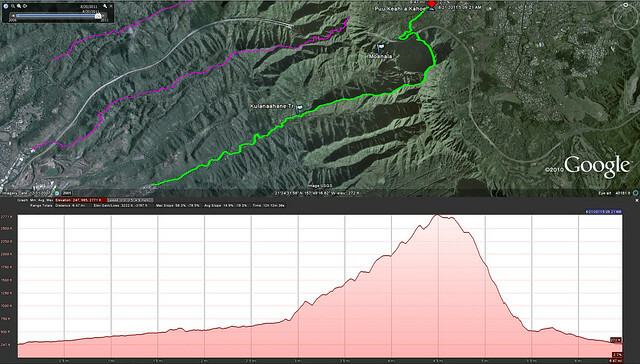 We ended up getting to Kai's car before it got dark, after over 12 hours on the trail! This was a hike I've been wanting to do for a very long time. Special thanks to Kai and Chas for joining me. It was crazy but so much fun! 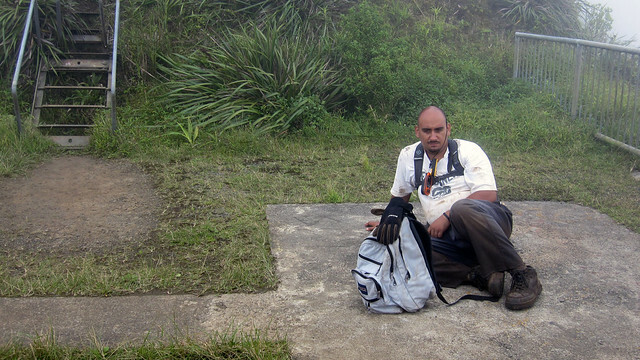 tuff hike and 12 hours? no thx! !